Il cimitero degli inglesi - FLORENCE LIVE! Being a Protestant burial site, this cemetery was placed outside the city walls near Porta a Pinti, the gateway after which it was originally named. The cemetery stood on the top of a natural hill where Florentines used to go in the early 19th century to watch ball games being played on the adjoining piece of flat land (present-day Viale Matteotti). In 1827 the area was sold by the grand-ducal government to the Reformed Anglican Church of Switzerland and enlarged in 1860 after the purchase of an additional parcel of land. 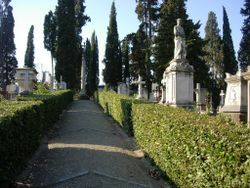 The current layout of the cemetery was devised by Giuseppe Poggi as part of the "Florence Capital" plan, which involved the demolition of the city walls and creation of Piazzale Donatello with gardens and trees to the north. The square took on its present-day appearance in 1870, with the creation of city ring roads, the construction of the "artists' district", various works of landscaping with the cemetery standing as an island at the centre, set slightly away from its neighbours. 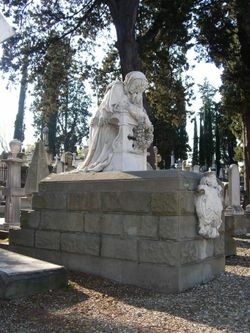 The cemetery was closed in 1877, and became the memorial site "[…] of a small community in the cosmopolitan, non-conformist 19th century" that honoured Florence with its presence. The layout of the cemetery is simple and rational: two main gravel paths running at right angles to each other, with a column erected by Frederick William of Prussia in 1858 at the point where the two paths meet. The graves are not laid out in regular ordered rows as in Catholic cemeteries, but in a romantically landscaped manner, creating a natural feel that is accentuated by the lie of the land and the presence of a variety of trees and shrubs. The cemetery is an interesting reminder of the foreign community that lived in Florence: the tombs of J.P. Vieusseux, the pedagogue Enrico Schneider, the philosopher Sismondi and historian R. Davidsohn testify to the community's cultural endeavours. Other equally important figures buried here include artists J.C. Muller, S.G. Counis and H. Powers and leading Anglo-Florentine writers such as Elizabeth Barrett Browning, A.H. Clough, W.S. Landor, Frances Trollope and his daughter-in-law Theodosia.